Crème Brulee is my absolute favorite dessert. One thing about it that makes it so special and decadent (besides the creamy perfection), is that I have it so rarely. And when I do, I want to slowly savor each and every tiny little bite. This is one of those desserts that has to be eaten SLOWLY, because why would you want to rush anything so perfect? I’m so excited to be sharing this recipe from Executive Chef Daniel Billheimer because let’s face it folks–he knows exactly what he’s doing when it comes to making this French dessert. 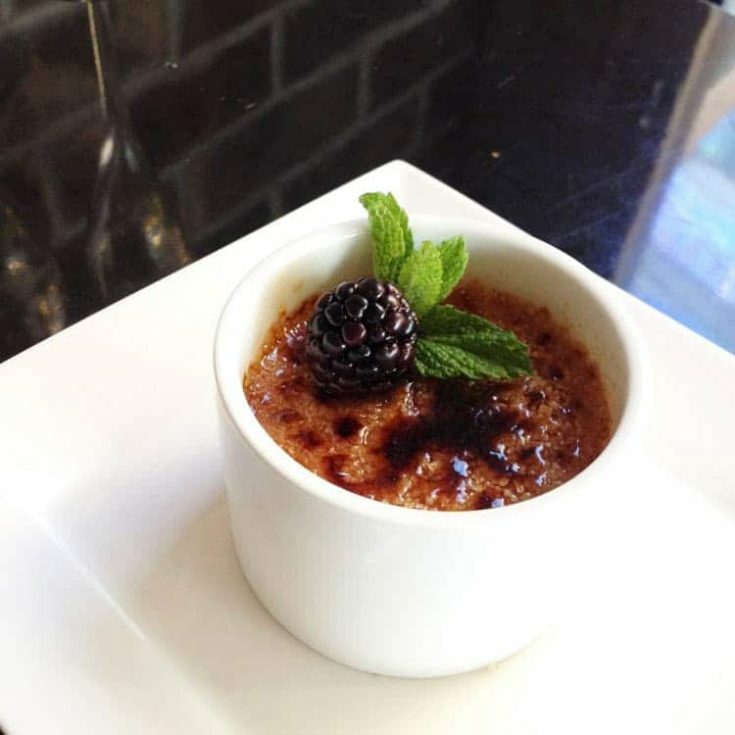 And on Valentine’s Day weekend, Chef Daniel will introduce a Chambord Crème Brulee at Monarch. But if you can’t make it to Monarch (located at 71 West 35th Street, perched 18 floors above midtown Manhattan), we’ve got Chef Daniel’s recipe below so you can make this sweet treat at home! Now, while I’d much rather be enjoying the spectacular sights of midtown Manhattan and a picturesque view of the iconic Empire State Building from a table at Monarch, it’s safe to say serving up this sweet at home is a sure and simple way to surprise your sweetheart with a treat that is sure to impress. To make creme brulee, you need the right equipment. Thankfully, the tools to make creme brulee are easier to find online than in stores…and trust me, I’ve made the rounds looking in local stores for ramekins to no avail. White Creme Brulee dishes are easy to find on stores like Amazon. For the top of the creme brulee, you’ll either want to use your broiler (and watch closely), or a culinary torch. I have never made creme brule before, but this sounds so doable! I have a brule torch, I should put it to use. Love this creme brulee, I need to make it, thanks for sharing with Hearth and soul blog hop. pinning and tweeting. I just love Creme Brulee, this is a great post. Hope you are having a great day and thanks so much for sharing with Full Plate Thursday. It looks so delicious! What a decadent, wonderful treat! That is one of my favorite desserts and yours looks wonderful. I hope you will share this at Thoughts of Home on Thursday tomorrow. Just stop by my blog any time tomorrow to join in. Creme brulee is also one of my fav desserts!! Ohh my I havent made Creme Brulee in a while and this reminds me to get my baking marigolds out. Thanks for sharing this gorgeously delishh dessert on the Bloggers Pit Stop! Oh how I miss creme brulee so much. Your recipe looks delightful with the variety of ingredients like mint and berries.